If you’re thinking, “where on Earth is Lithuania?” and didn’t know it existed than you’re in the same boat I was before we left for Europe. The least I can do is bring this European scene to your attention. In case your lost because you’ve been reading these travel posts in order, our trip to Lithuania was a continuation from Amsterdam. Pablo and I had been nonstop backpacking for nearly a year at this point and our friend, Melissa, had joined us. I am simply just catching up on the last few, but note-able spots we went to on our long way home. What’s this Lithuania you speak of? 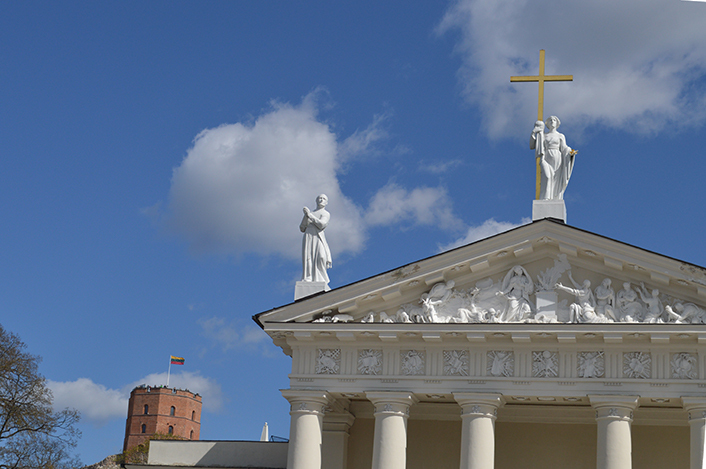 Our visit to Lithuania was mostly spent in Vilnius, it’s capital city. Lithuania is a Baltic country located north of Poland and Belarus. The Baltics is the short name for the countries lining the Baltic Sea; Denmark, Estonia, Latvia, Lithuania, Finland, Germany, Poland, Russia and Sweden. Lithuania, Latvia and Estonia are not as traveled through compared to it’s neighboring Baltics, and therefore are more focused on local customs and traditions instead of pleasing tourists for money. Overall I would say this country is very authentic and will give you a taste of the Lithuanian folk customs and culture. Since we hadn’t known about the existence of Lithuania for long, we hadn’t had enough time to make expectations of what it would be like. I wish I’d done more research beforehand, but in the end it would’ve been for naught. Due to the cold weather and a couple of us fighting colds we ended up inside our Airbnb a majority of the time. Our Airbnb had a fireplace, foosball table, swing, TV with movies and shows and a loft perfect for hanging out. It worked out to be the best place for us to stay in from the cold. Since it was April while we were here the weather would go from low 30 F up to 50 F we had chances to slip out and enjoy the sunshine. 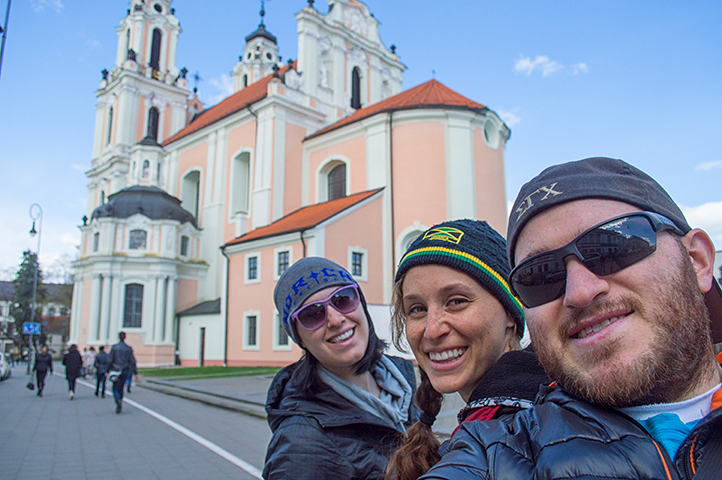 On one of these rare warmer days we managed to venture outside and headed to Vilnius most iconic spot, Old Town. As we entered Old Town I felt taken back into history. The streets were lined with cobble stone and we had to duck to enter some of the small shops. We walked under the Gate of Dawn and to the Church of St. Anne (1500’s). The structures of Church of St. Casimir (1618), and the Orthodox Church of the Holy Spirit (1749-1753) were impressively old looking. We also walked to the Cathedral Square and were able to enter many of the churches listed above. I probably left out a couple places that we passed by or went to on our walk through the city. There were an impressive amount of historical sites in the small radius of where we were. 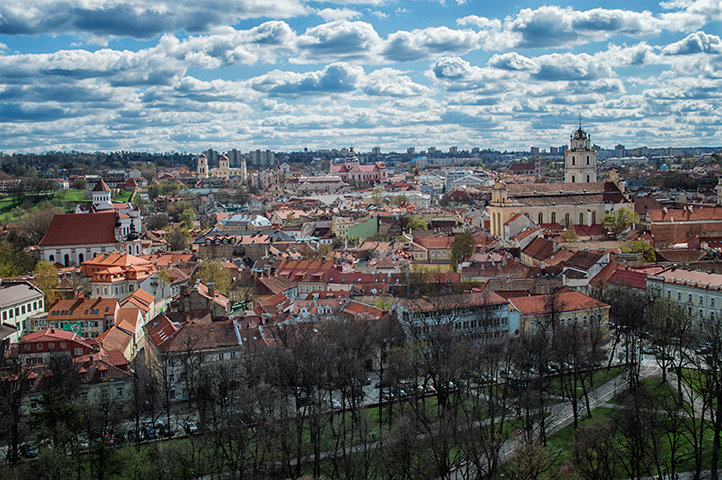 The Medieval Old Town is large and we had a great view from Gediminas Tower. From the Tower we could see the Neris, a river that flows from Belarus and through Vilnius. Although the Tower provided a spectacular view, it also provided a smack in the face from the cold wind. We climbed down and walked through the Old Town until we came to our lunch stop, Meat Lovers. This place was cozy and the food delicious. With our bellies warm we were ready to go back to the AirBnB for some R&R. The next day we would go out again to explore. A castle on an Island = always a cool sight to see. We took a bus ride (about 40min.) 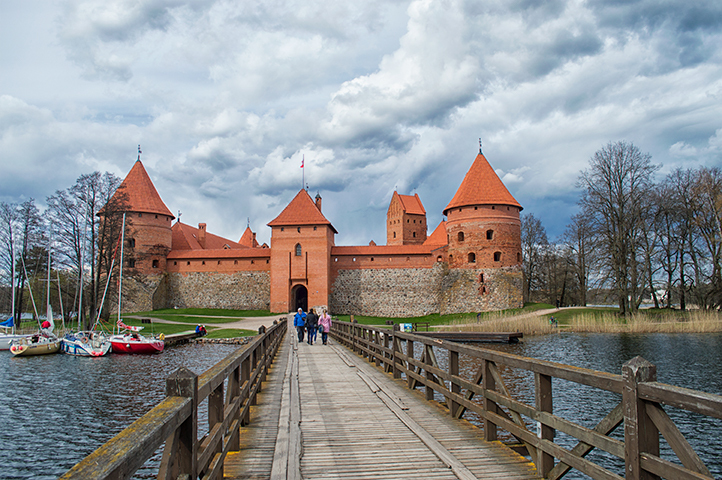 out to the Trakai Island Castle. 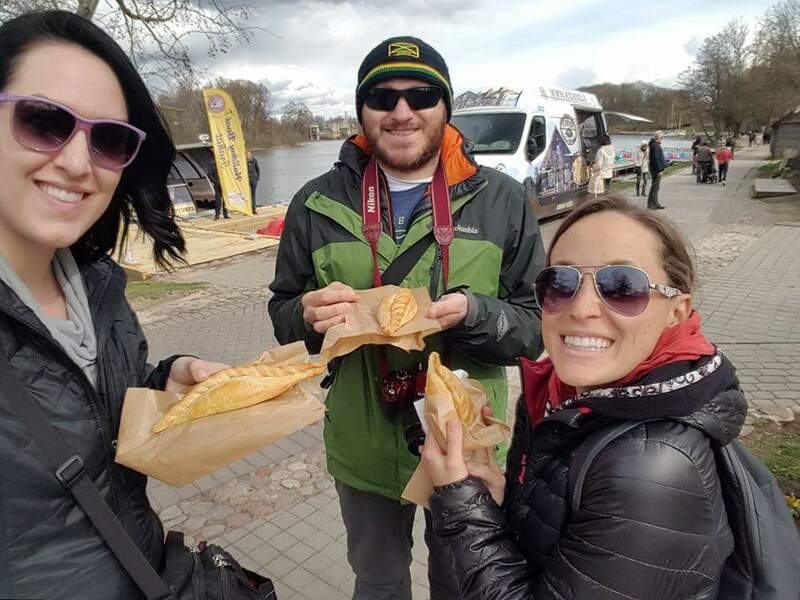 Before walking to the castle we stopped at the food truck and each of us ordered a totoriski ceburekai (delicious and basically an empanada). 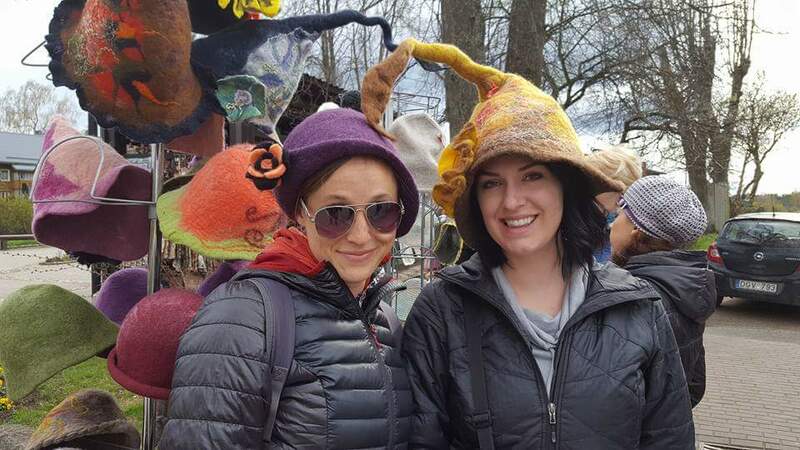 There were also small shops and we stopped at one to try on ridiculous looking hats. After walking through the courtyard and around the grounds of the Castle we stopped at a bench for lunch. As we pulled out our sandwiches and chips the ducks from the moat became friends with us. It was a fun day trip and the castle grounds were fun. One place that I would’ve liked to go to if we’d had the chance while in Lithuania was to the Hill of Crosses. It’s a pilgrimage site where over 100,000 crosses are grouped as a symbol of peace. It was further out than we were willing to travel since we didn’t have a car. Per usual we skipped the museums in Vilnius because we are not museum goers. We are outdoor adventure and interesting sites type travelers so I can’t give you advice on the topic of museums. However, I can tell you there are MANY museums in Vilnius that will fill your agenda. My recommendations for when you’re planning to visit Lithuania; plan around a festival or come in the summer time. It was nice and calm while we were there, but I imagine it’s more enjoyable to be there when there’s more going on. It’s also more enjoyable to walk around a city when you’re not cold and fighting a cold! 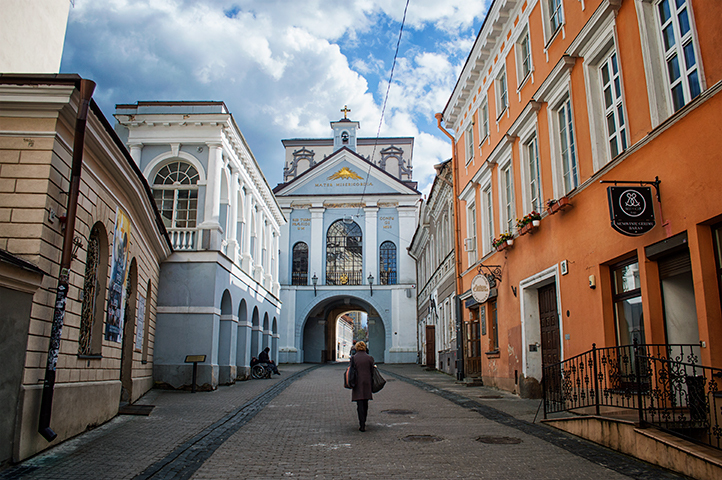 While you’re there stop in some of the museums, explore the different food (make sure to try the Cepelinai and Borscht) and learn about the different religious practices and churches. This was a beautiful country and city to visit, and I’m glad I now know it a little better than I did before.